618. India’s Holi Festival – March 27 and later, 2016. The Indian festival of Holi is on March 23 and 24 this year. 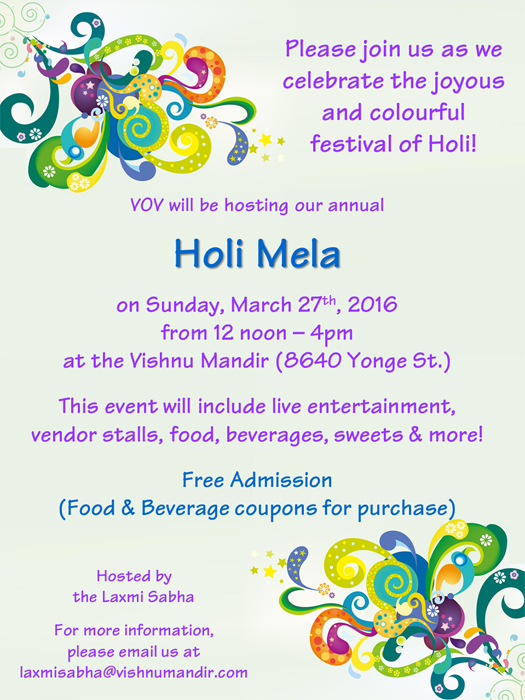 The Holi Fair at the Hindu Mandir temple is on March 27 from noon to 4pm. For our blog about what happened at this coloured powder-throwing event last year, see: http://bit.ly/1nUuFP0. The BAPS Shri Swaminarayan Mandir temple will also be celebrating on Sunday, March 27 from 4:00 pm onwards. Its newsletter says “Fuldol, also known as Pushpadolotsav, is celebrated on Fagun Vad 1, the day after Holi. Pushpa means flower; hence, this is the festival of flowers and colors. On this day, devotees place the murti of Bhagwan in a hindolo made of colorful flowers, which is then gently swung by devotees. People also spray colored water and toss gulal powder on each other. The sentiment behind the festival is to ask God to color one’s life with bhakti and to symbolically bring God closer to one’s heart by continuously striving to offer bhakti.” Its address is: 61 Claireville Drive near Hwy 427 and Finch. Other Hindu temples will be celebrating too. Please contact them directly if you want to join this important religious event. 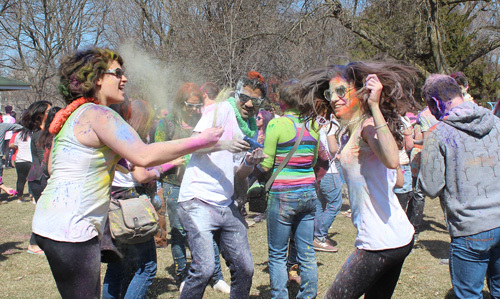 We expect that the annual free secular coloured powder throwing event will be at Woodbine Park around this time too. Its Facebook page is https://www.facebook.com/RANGDETORONTO/. The big annual Holi Mela will be in Milton at the Fair Grounds, 136 Robert Street on June 4. A Holi Love Festival is planned for Woodbine Park for May 7 but it is too expensive to be mentioned here. Please let us know about your adventures in multicultural Toronto.